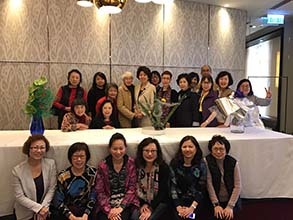 Registration deadline: 16th Feb 2019! 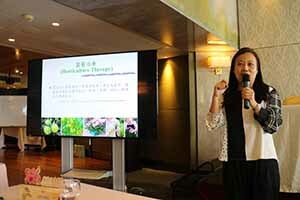 She explained that plants or flowers can bring therapeutic effect to a person who engages with it. 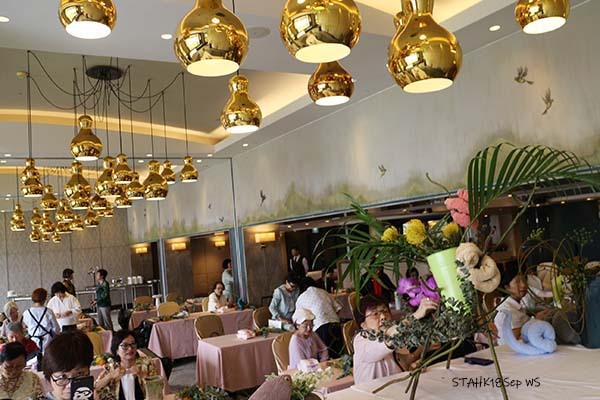 It can be through gardening, arranging flowers or just being around in the nature. 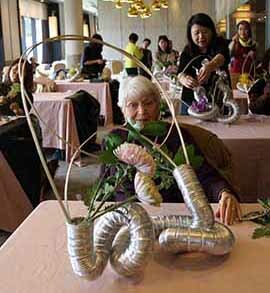 Theme: Create a living sculpture. 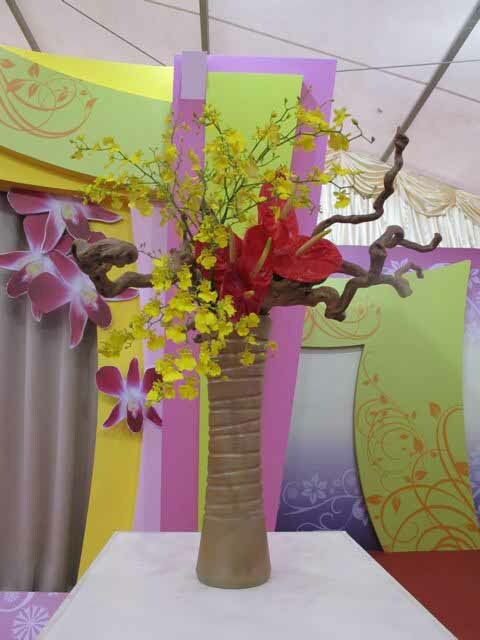 Theme: Create movement with branches. 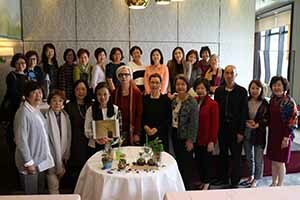 Ms. Otani Mika, a Riji teacher from Japan, gave a demonstration on 2019 March 24 at HKFS. 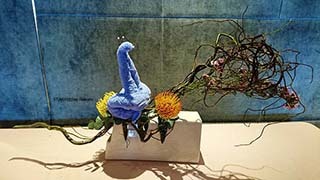 Titled “Adventure with Flowers”. We are honored to invite Mr. 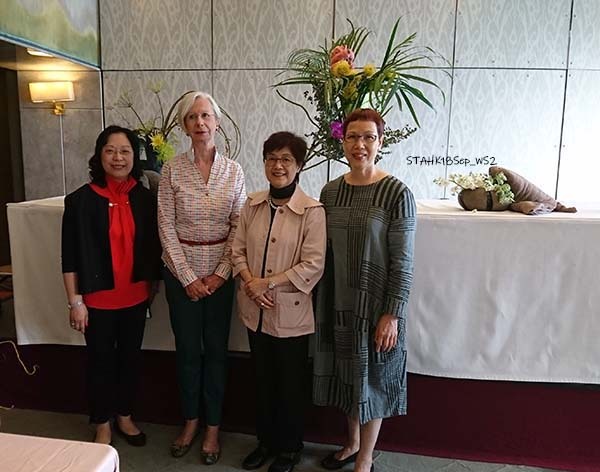 Ambassador & Consul General of Japan and Mrs. Wada and 2019 HKFS Director, Ms. Or, and sincerely thanks for their coming and supporting. 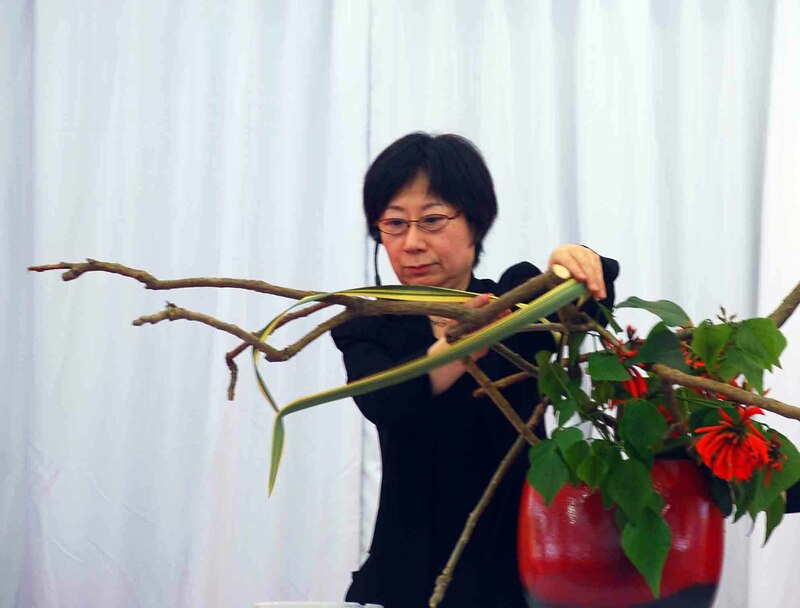 The show was a success despite of rain, it attracted many ikebana lovers and general public with warm applause. 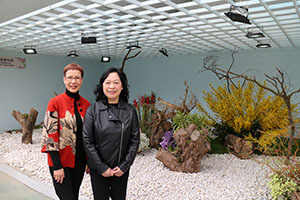 The group exhibit awarded "Grand Award for Unique Feature" at the Hong Kong Flower Show of Displays Section (Local). 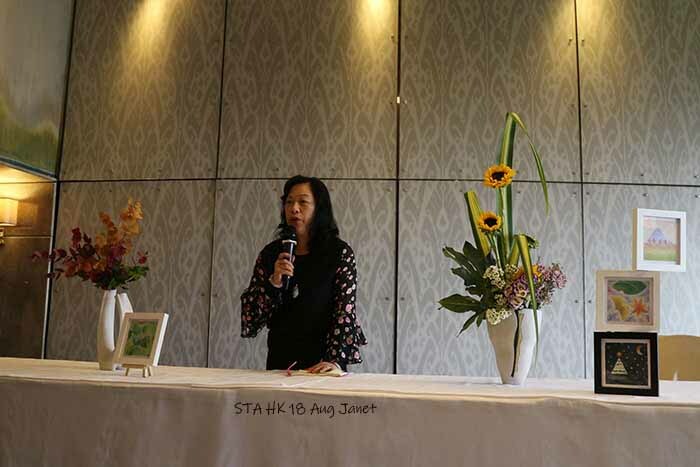 This year, the Annual STA Exhibition was successfully held at 7 Mallory Street, Wan Chai. 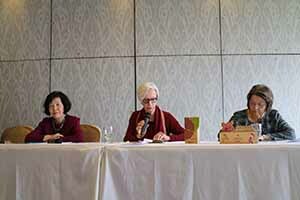 It was well received and attended by more than 800 viewers during those 3 days event. 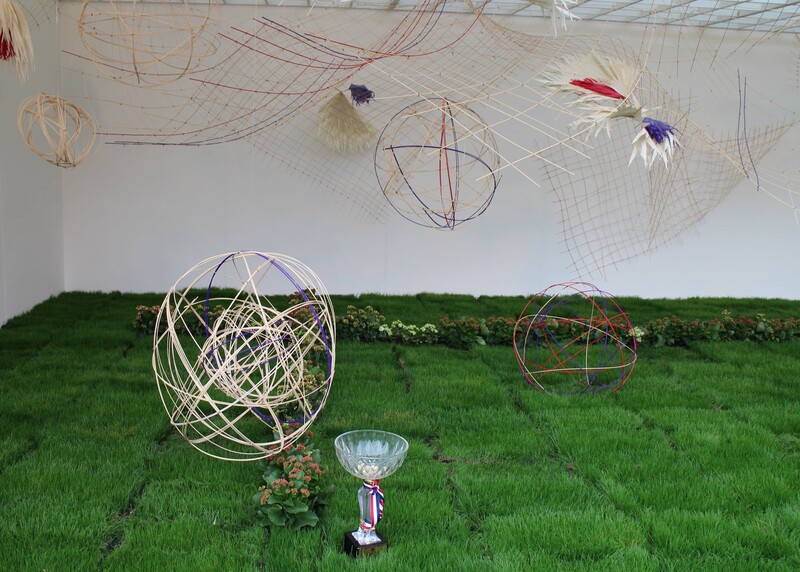 Two group-works and 42 individual exhibits attracted a lot of praises from visitors. 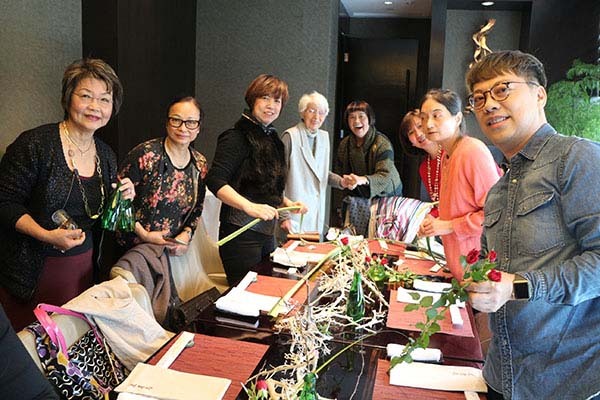 Our heartfelt appreciation to Mrs. Naoko Hirota, the wife of the Acting Consul General of Japan, and Ms. Wendy Or, Chief Leisure Manager of LCSD, for participating in the ribbon cutting ceremony. 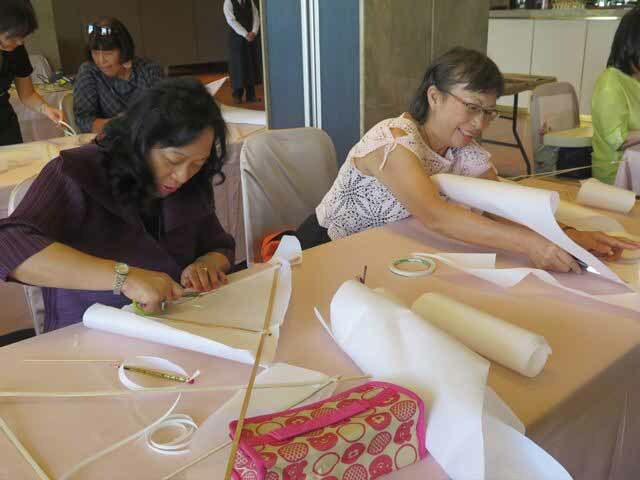 There are 76 Sogetsu teachers and learners attended this Textbook 5 training session. intending to provide some actual examples. 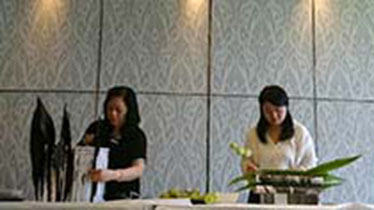 The attendees received their certificates and left the room happily around 4:30pm. 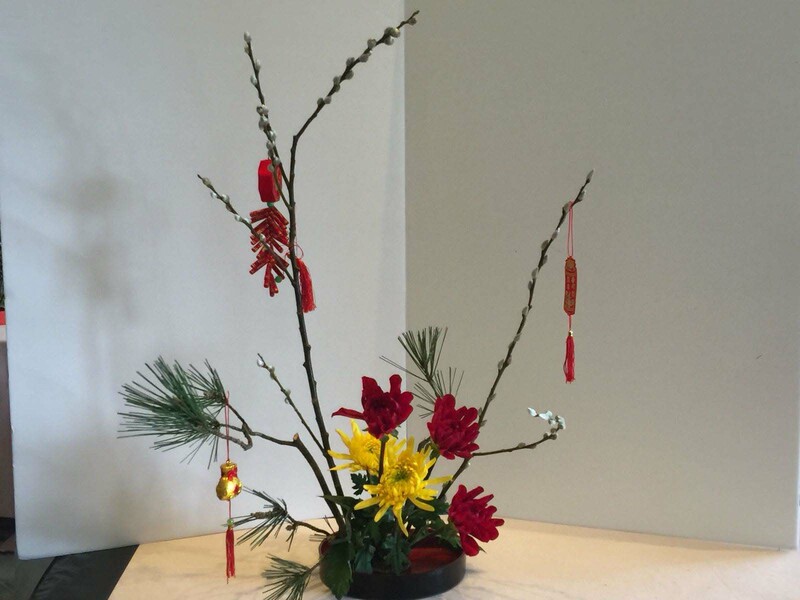 Materials:Dracaena reflexa, Pokeweeds, Chrysanthemum, Cotton Milkbush...etc. 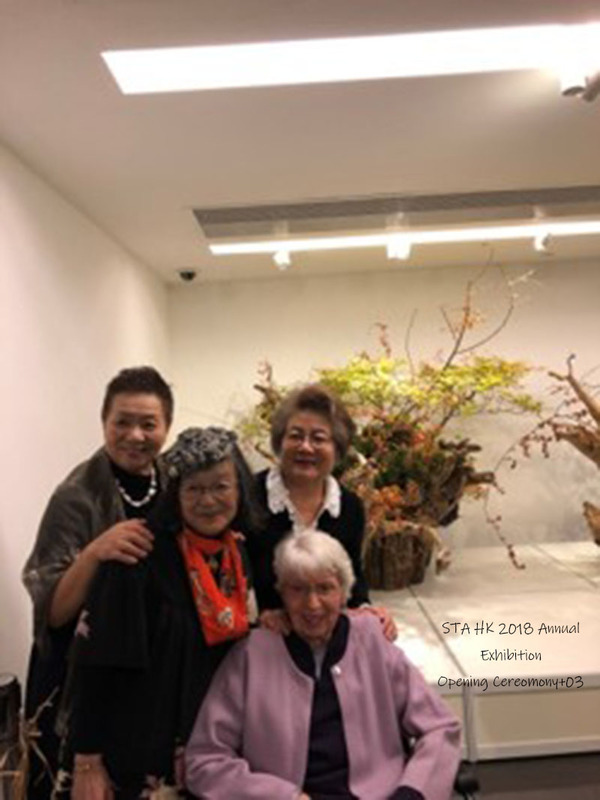 In April 2018 most of our members were busy helping with the organization of the 14th ARC of Ikebana International. 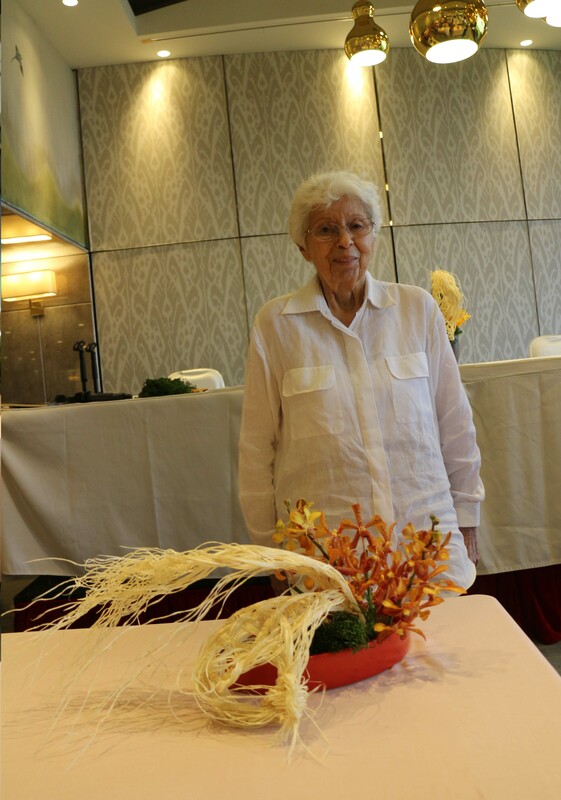 Our association was asked to be in charge of the table arrangements of the Welcome and Sayonara Dinner. 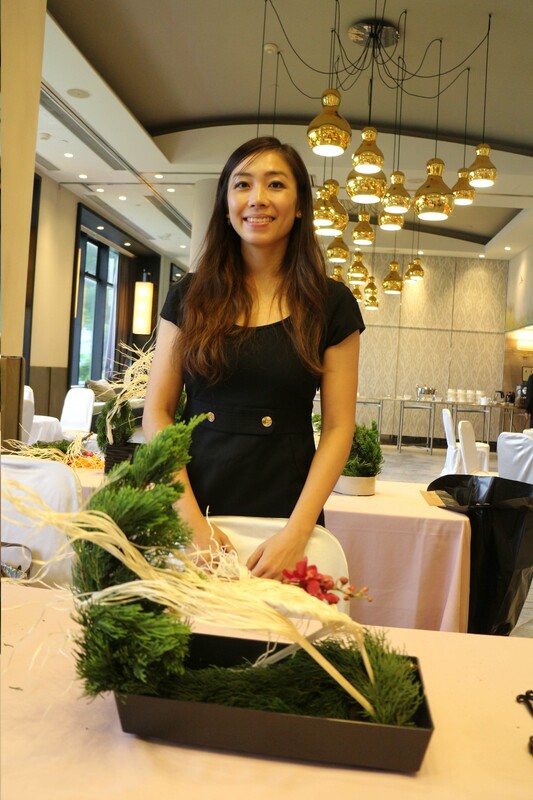 The ones for the Welcome Dinner were left in natural color, standing on a base of white dried wood and spindle tree branches, with red/green anthurium and asparagus fern for accent. 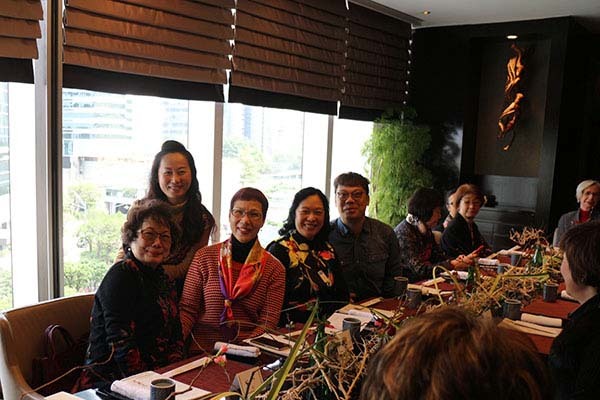 The meeting was followed by a presentation from a special guest, Mr. Rico Chan, Founder and CEO of Beyond Vision Projects. 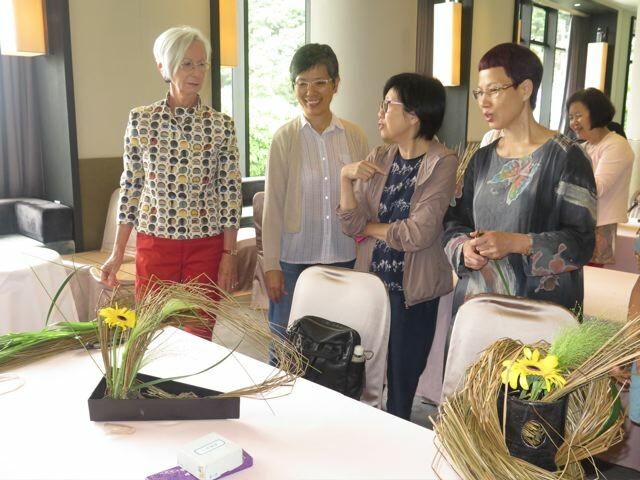 He explained that the mission and goal of his social enterprise is to enhance the quality of life of people who visually impaired and of elderly with low vision by providing Tactile Audio Interaction System services. The tool will enable them to understand and engage visual information through touching and hearing the audio description. 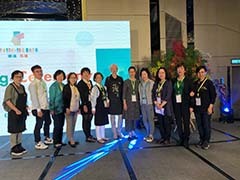 We appreciate Mr. Rico Chan for his inspiring presentation. 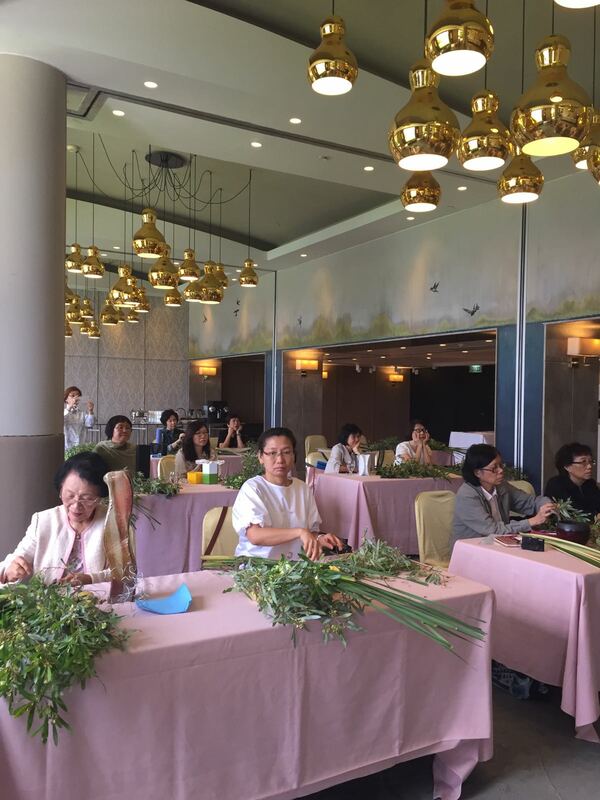 Materials: Dragon willow, Cherry Blossom, Patrified willow, Newzealand flax, Dendrobium, Sunflower......etc. 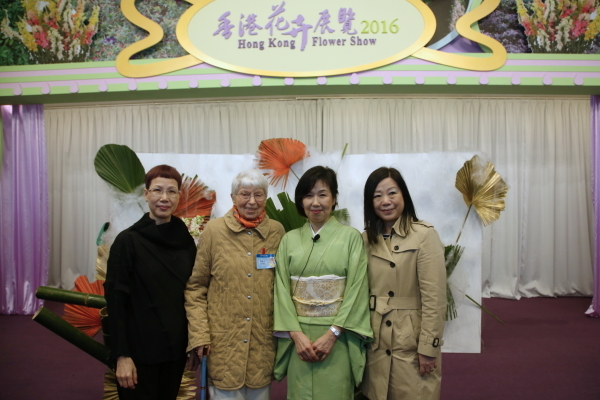 We are honoured to have Ms Kayoko Sawada, a master instrutor from Sogetsu Headquarters to be the demonstrator for this year’s HK Flower Show. 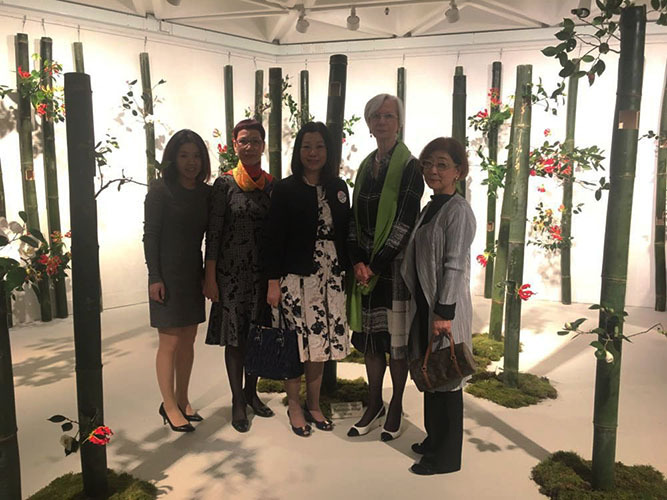 We are honored to have Mrs. Matsuda, the wife of the Consulate General of Japan, and Mr & Mrs Iwagahara,Deputy Consul General of Japan with his wife. 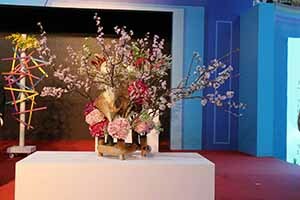 The show hugely enjoyed by many ikabanists and general public alike. 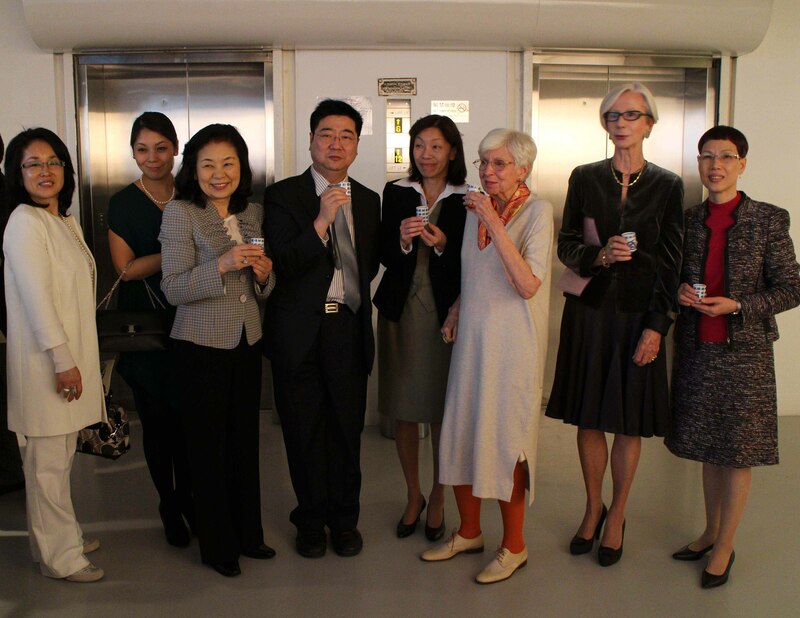 We are honored to have Mrs. Matsuda, the wife of the Consulate General of Japan, and Ms. Wendy Or, Chief Leisure Manager of LCSD, for participating in the ribbon cutting ceremony. Sincerely thanks! 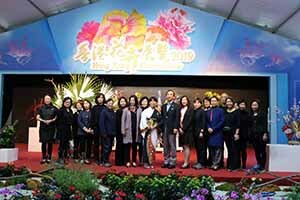 The annual event received a lot of praise and acted the part of a splendid finale to the Branch’s events in 2017 and it attracted hundreds of viewers visited. 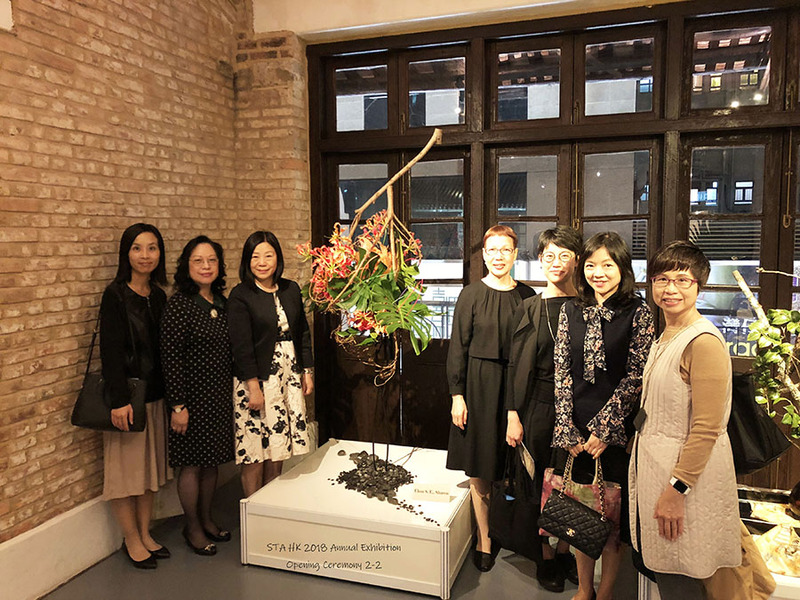 This year, the HK STA was back to our usual venue for the annual exhibition in the Pao Gallery of the Hong Kong Arts Centre, refurbished and looking fresh … With 2 group works and more than 40 individual exhibits. 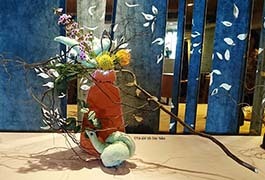 Some of the individual exhibition can be see in Gallery page. 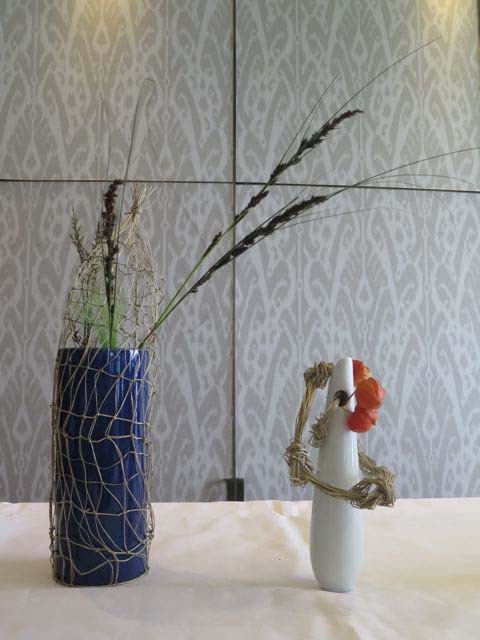 Materials: Philodenron, Dragon Willow, Gladiolus, Oncidium, Allium, Newzeland flax, Perch wood. 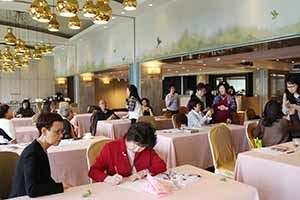 There are over 80 Sogetsu learners, gathering together at HKCC, a whole day session started at 9:30am. 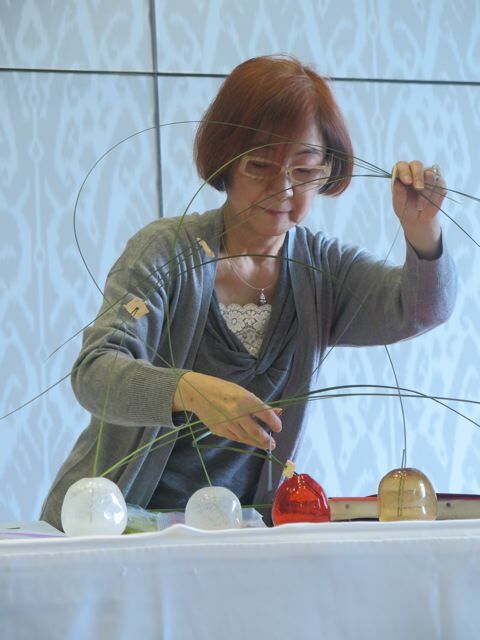 With 2 videos from Iemoto, Akane Teshigahara and 10 arrangements demonstrated by our master teacher, Ms. Ishikawa Misei. All participants learnt a lot about the new syllabus. All participants left happily before 5pm with their certificate for the new Textbook. 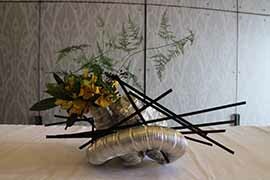 Materials: Sun flower (Helianthus), Asparagus, Eustoma, Cockscomb......etc. 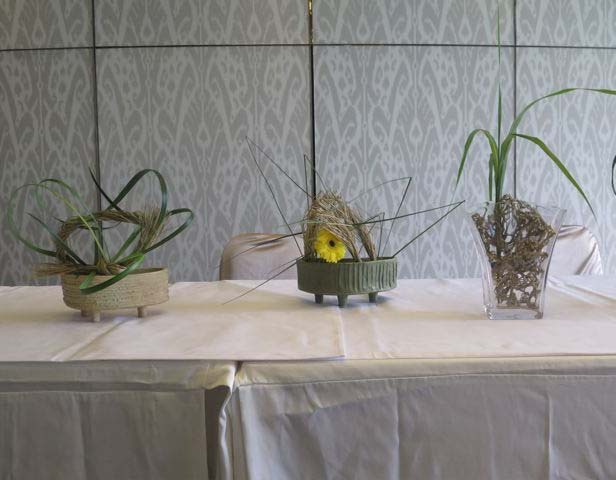 Materials: New Zealand flax, Alstroemeria, Typha orientalis Presl......etc. 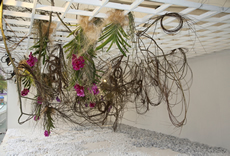 Title: Dried Palm, Plastic string, Allium, Dried wood, Monstera leave, and Chrysanthemum…etc. 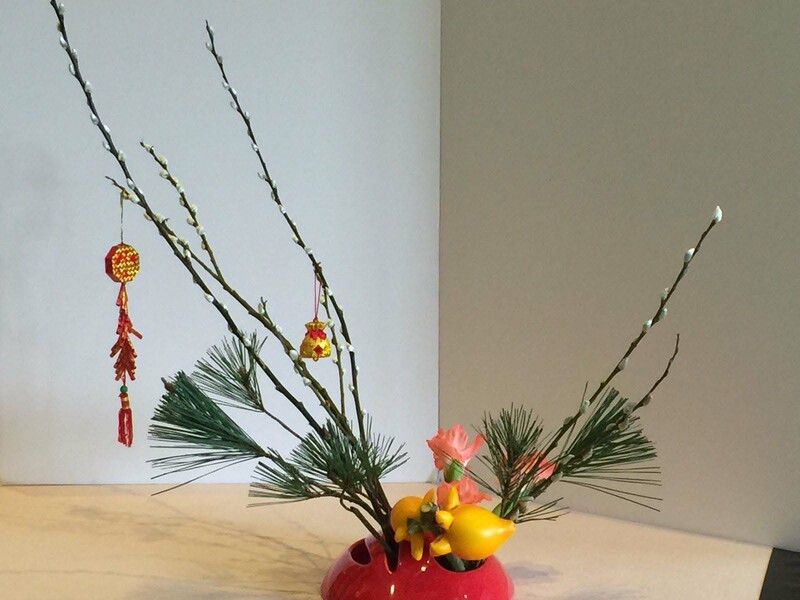 Materials: Palm, Green Anthurium, Horsetail, Bird nest leaves and China tree. 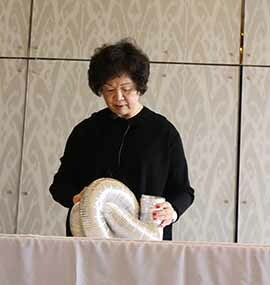 Ms. Kosa Nishiyama, a master instractor from Japan, gave a demonstration on 2017 March 19 at HKFS. Titled “Variations of a Spring Breeze”. 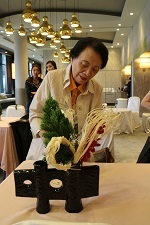 Her wonderful performance received warm applause from the audience. 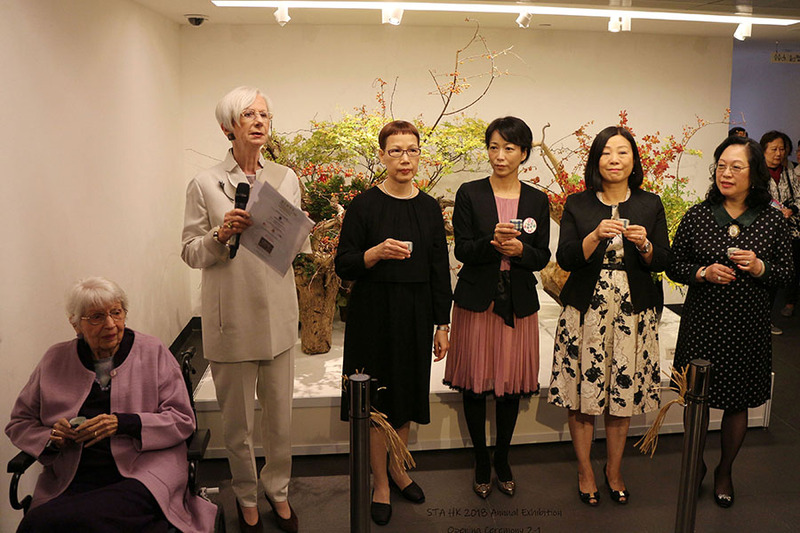 Our Annual Exhibition kicked off with the ribbon cutting ceremony, performed by jointly by Mrs. Matsuda, the wife of the Consul General of Japan and Ms. Wendy Or, Chief Leisure Manager (Green Campaign) of LCSD. 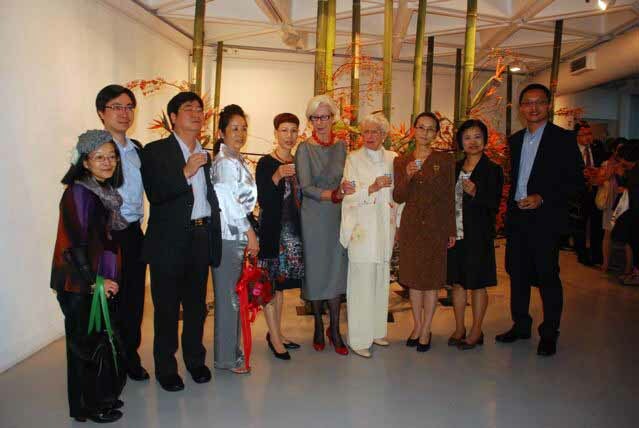 A toast was given and guests were invited to view the exhibition. 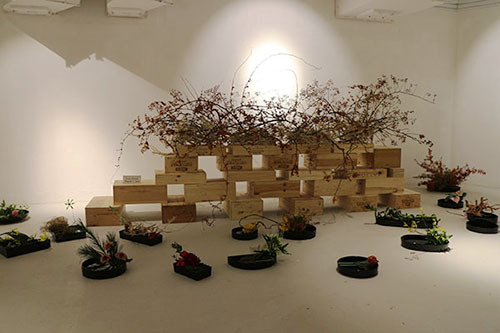 Albeit that our Annual Exhibition took place in a much smaller venue, there were 3 group arrangements and 36 individual creations with the theme of “ Flower Message” in different shapes, form, materials and containers. 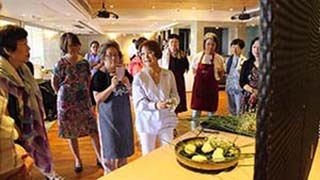 It went successfully and attracted about 600 hundred people. 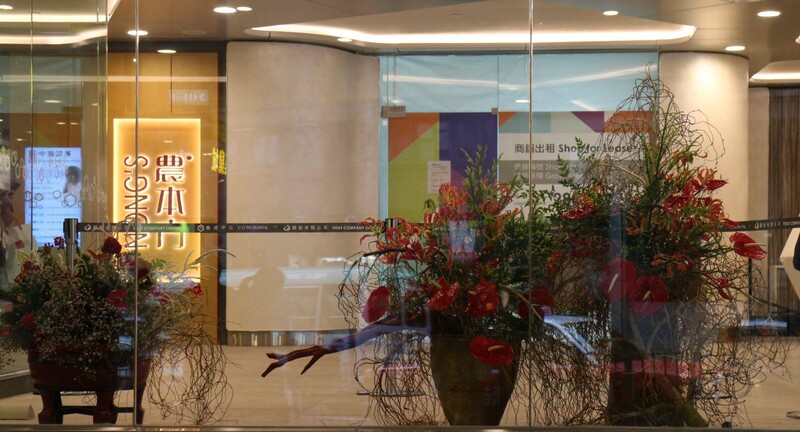 There are Three group works on 2 levels of CC Wu Building in Wanchai. 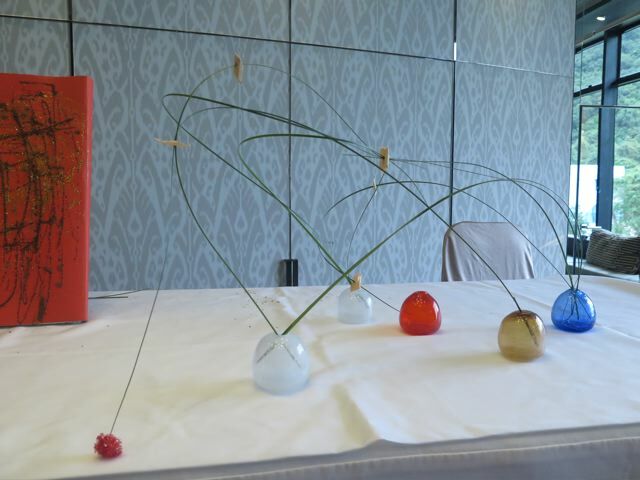 Materials: Cogon grass, Snow berry, Red orchid, Newzealand fax and Lily grass. 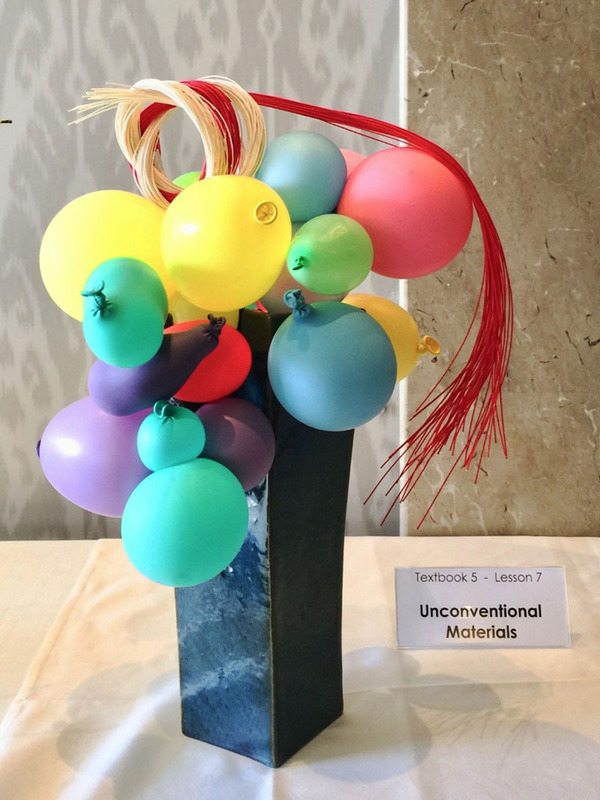 Materials: Horse tail, Cockscomb, Gerbera...etc. 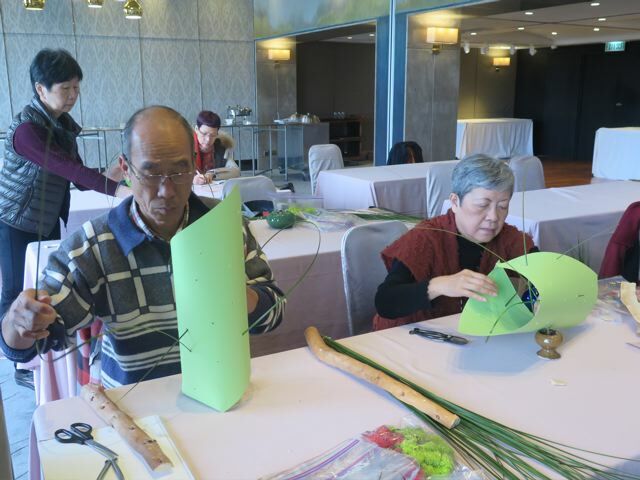 STA HK used the Dragon willow and Vanda to create the group exhibit. 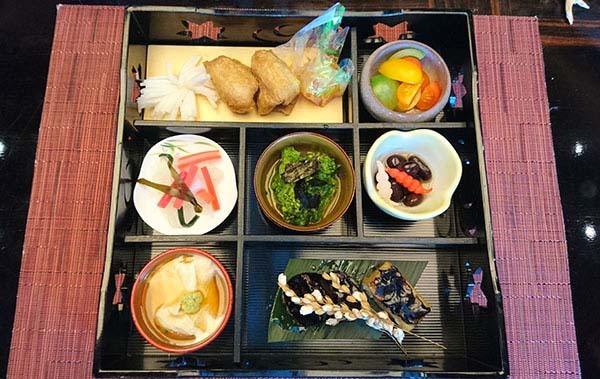 The duration is from 11 – 20 March. 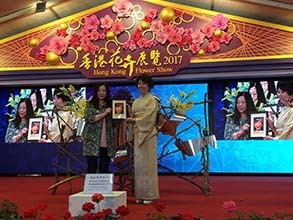 The exhibit won the Grand Award for Unique Feature of HKFS 2016. 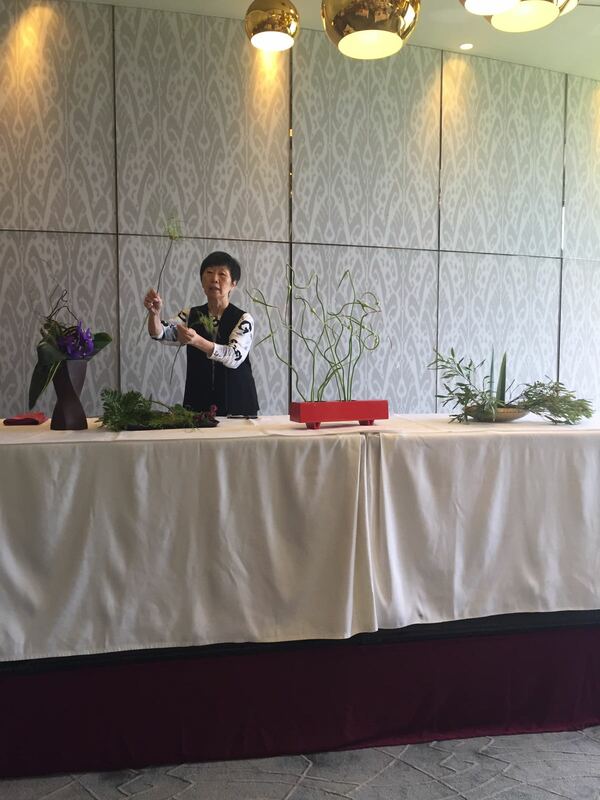 Ms. Misei Ishikawa, a Master instructor and RIJI at the Sogetsu Headquarters gave us a wonder demonstration on 20th March at the HKFS with the title of “Vitality”. 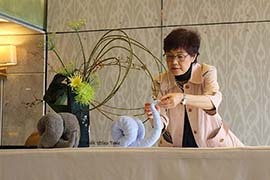 The demonstration attracted more than 400 public, the distinguished guests, ikebana friends on the day. The program ended in warm applause, and with great success. 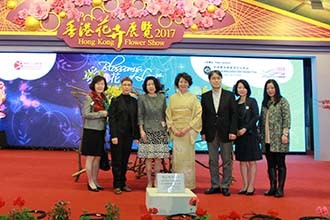 Our Annual Exhibition kicked off on 27 November by the ribbon cutting ceremony, performed jointly by Mrs. Matsuda and Mr. Horace Cheung. 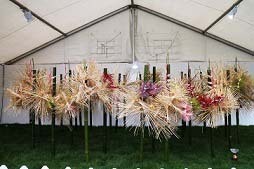 There are 3 groups works and 38 individual arrangement and attracted hundreds of visitors from 27 to 29 November this year. 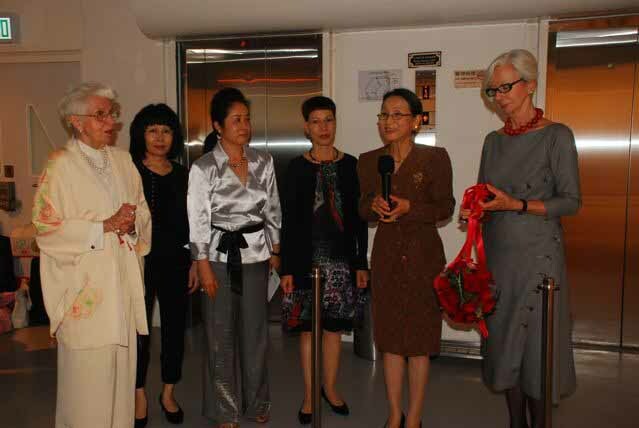 After a short speech by AnnaMarie, a toast was given and guest were invited to view the exhibition. The three group works got lots of compliments. 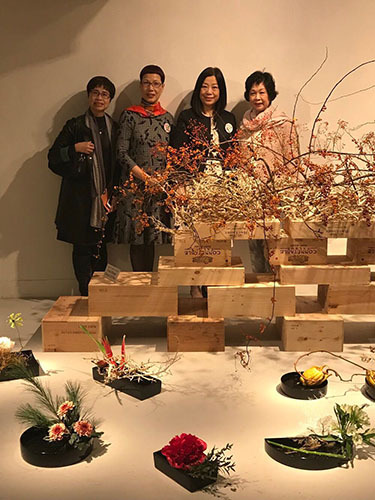 Ms. Sumura Eikou, Master Teacher from Sogetsu Headquarters in Tokyo, started her arrangement with the help of her daughter Okubo Yasuka and her assistant Mochizuki Hiroshi in the lift lobby in the signature Sogetsu bamboo style. 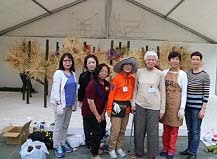 Mrs. Ebuchi Yoko made a “big construction” with the big wall which showed the real power of flowers. 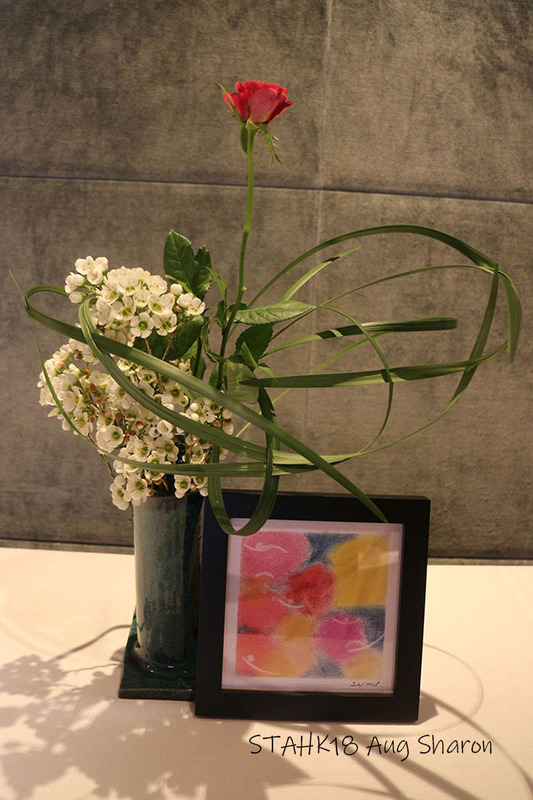 Sharon Chou created a “floating” arrangement in the small room. Materials: Dried palm, Cedar and Orchid. 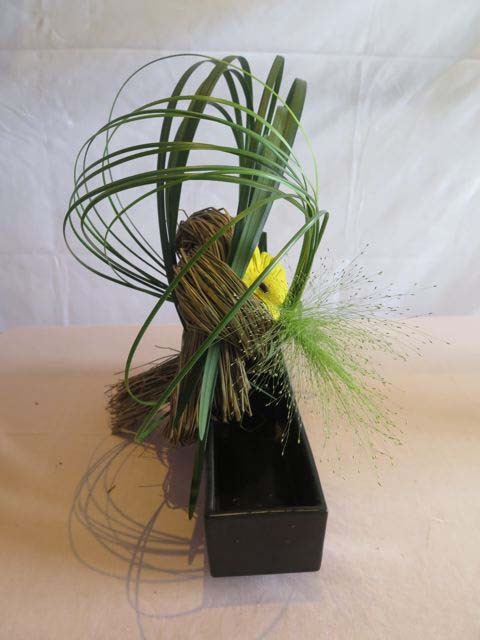 Materials: Dried Straw, Steel Grass, Ophiopogon, Fountain Grass, Miscanthus or Susuki (variegated) and Gerbera. 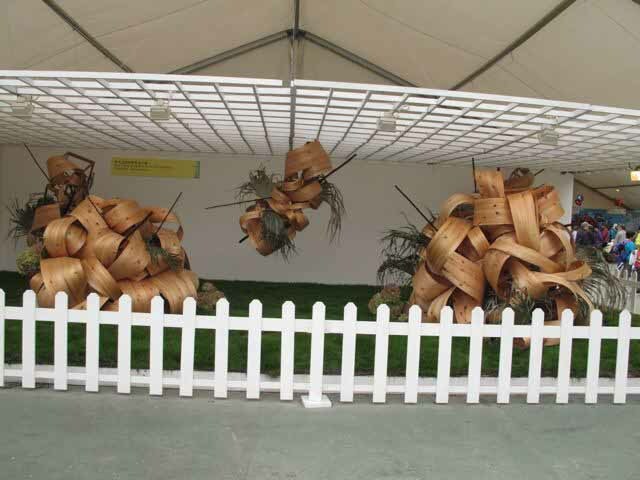 We used about 28 pieces of fresh bamboo poles to form structure and support of the exhibition work. 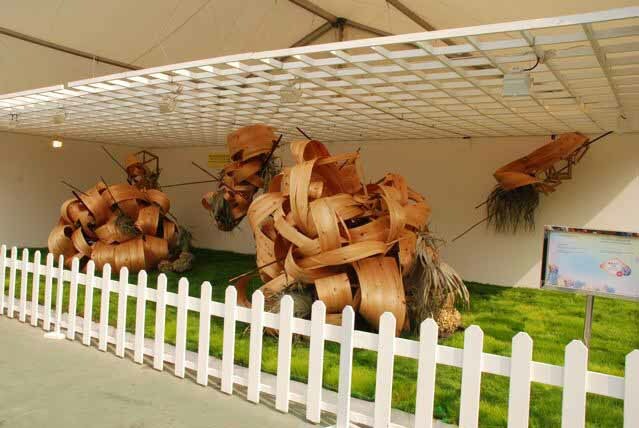 The beige reed and colored rattan blinds were twisted in different forms to create the mass and movement. 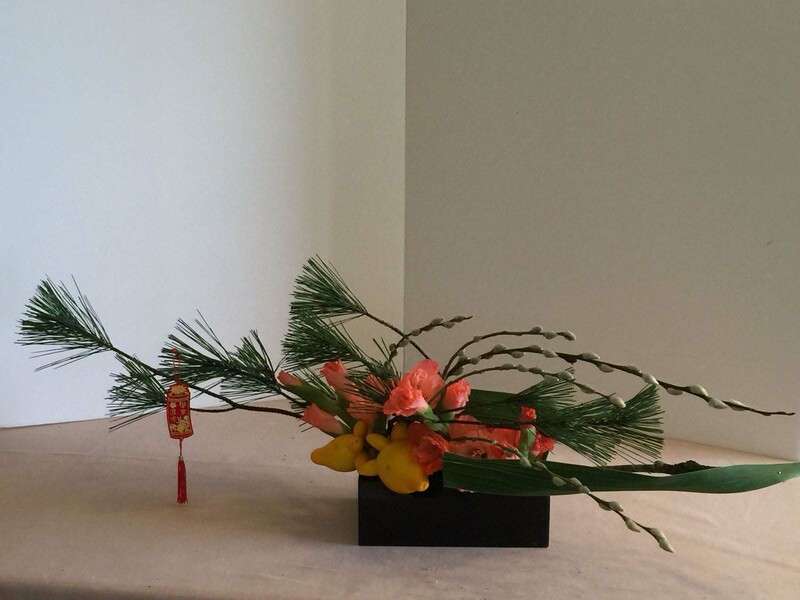 Adding the fresh fox face and heliconia, enhanced the vitality and contrast to the dry material of the whole arrangement. 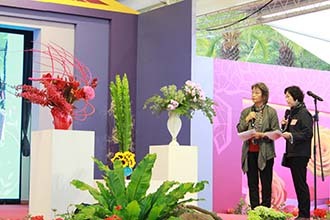 The group exhibit got the Unique Feature Special Award. 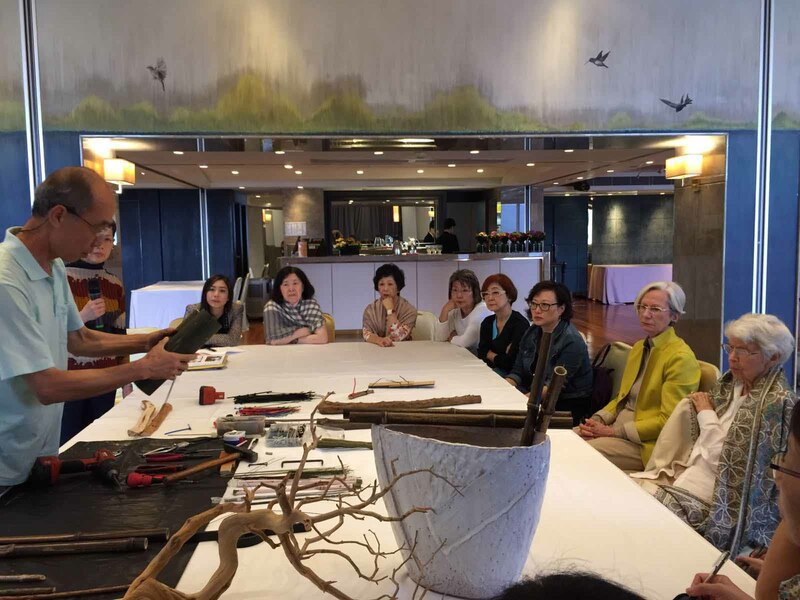 Mr. Hinata Yoichi, a Master instructor and RIJI at the Sogetsu Headquarters, gave us a wonderful demonstration on 29th March at the HKFS. The demonstration was a big success on the day. 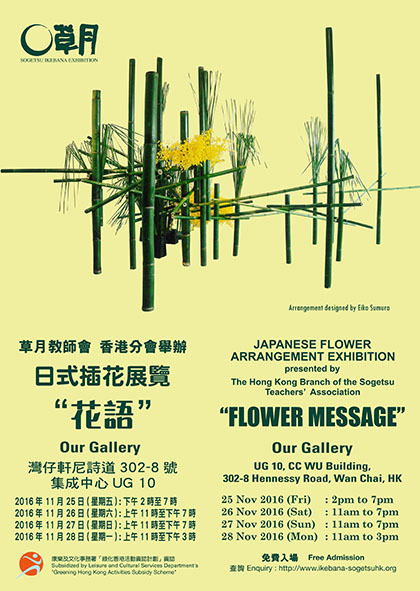 The HKSTA Annual Exhibition at the Arts Centre from 28 November – 30 November 2014. 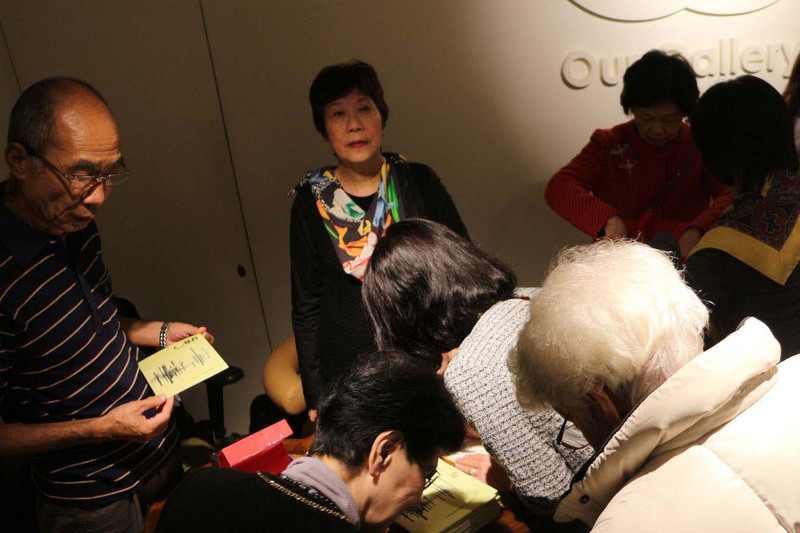 As usual, the exhibition attracted many hundreds of visitors including overseas supporters over the whole period. A lot of thanks to all! 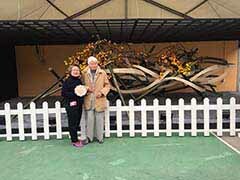 Besides, we are much honored to have Mrs. Noda and Mr. Horace Cheung as our special guest on 28 November again. Many thanks! The three group works got lots of compliments. 1. 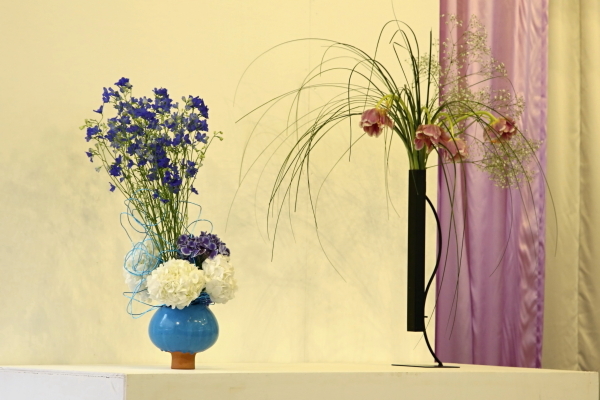 The attractive display with the reed blinds against the black walls. 3. 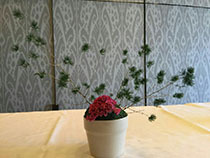 The mysterious display in the small room with paper, dried and fresh plant materials spiced with red peppers! 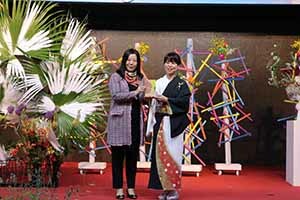 33 individual exhibits were featured ranging from the traditional, creative and express oneself. 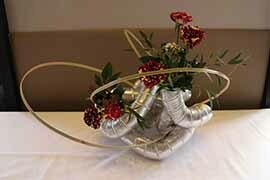 Please see the gallery page for some of the arrangements. 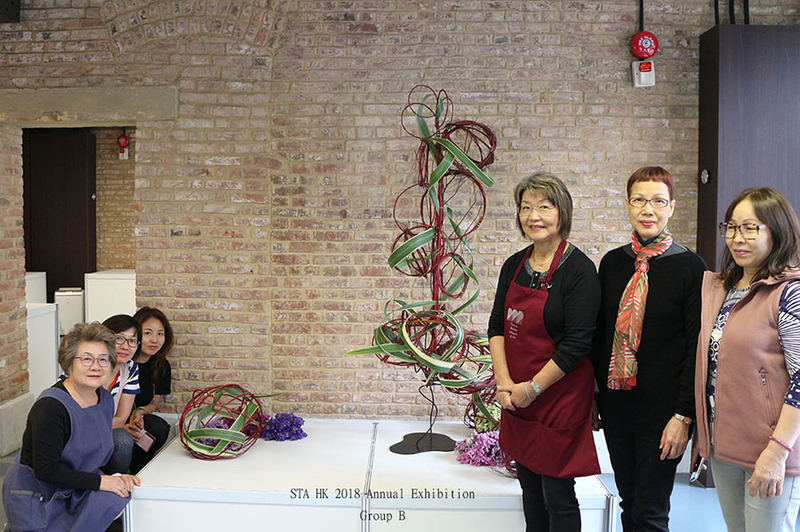 STAHK used the 3 colored rattans to create the group exhibit, together with dyed windmill palm, kalanchoe and turf from 17-26 March. 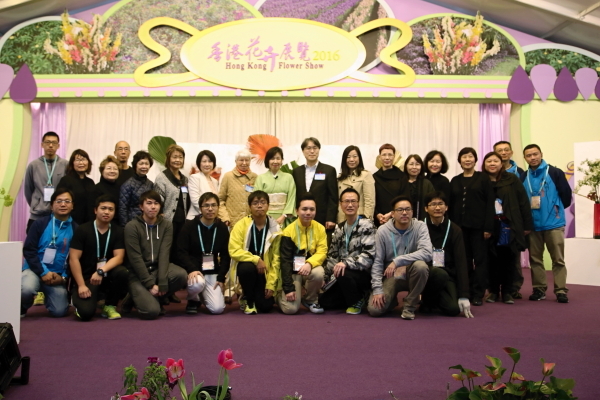 The exhibit won the Grand Award for Unique Feature of HKFS 2014. 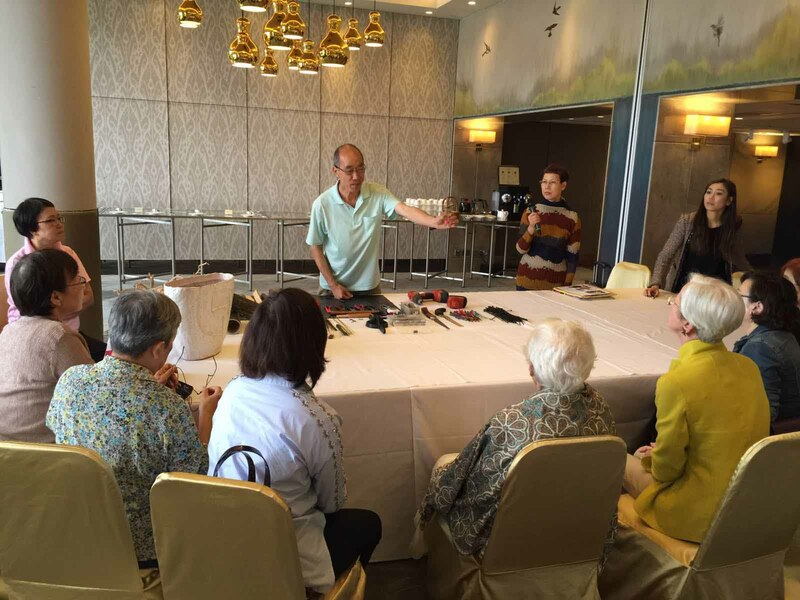 Mr. Ken Katayama, a Master instructor and RIJI at the Sogetsu Headquarters, gave us a wonderful demonstration on 16th March at the HKFS. The demonstration was a big success on the day. 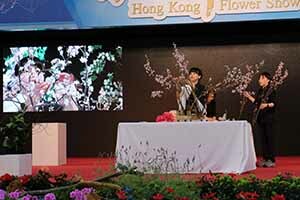 The Exhibition, held on 29 November 2013-1 December 2014 at the H.K. 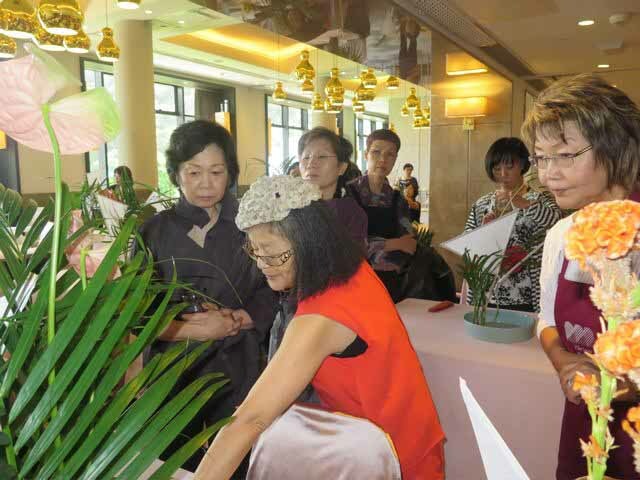 Arts Centre, Wan chai, was a great success as ever and attracted hundreds of visitors. 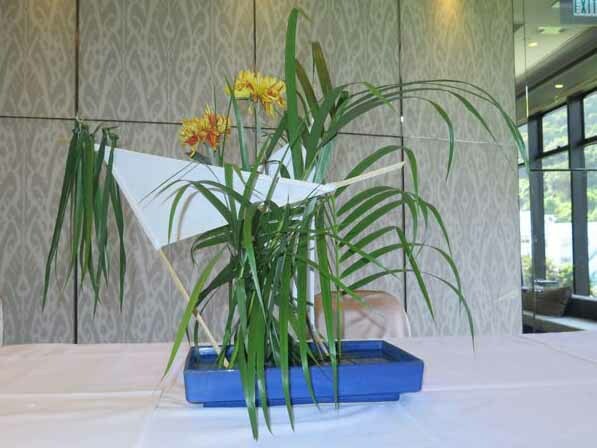 There were 43 individual's ikebana creations as well as 3 group works. Please view here for the group works and gallery for some of the individual arrangements. 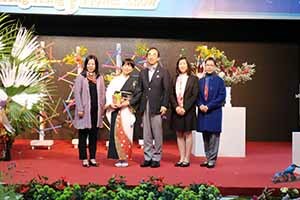 This year many guests and friends come to attend the opening ceremony on 29th December, bringing a lot of the glory to the exhibition. 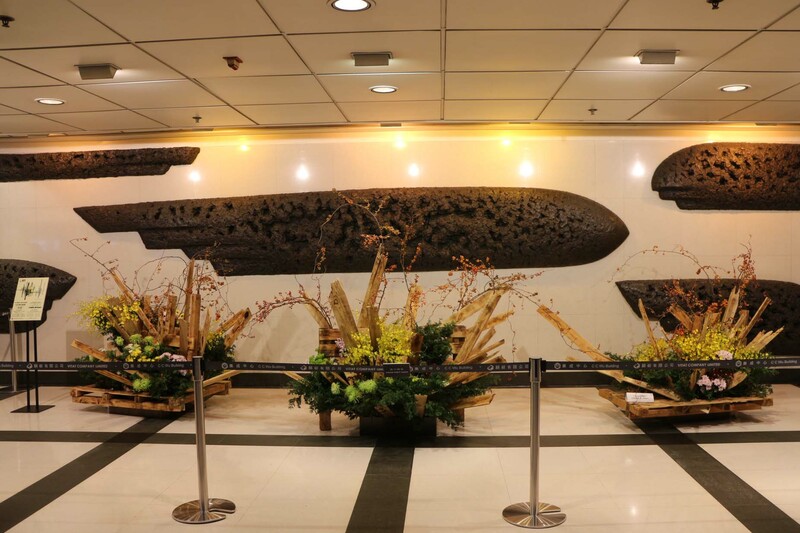 The work at the entrance featured bamboo, drift wood, dried palm sheaves, camellia branches, dancing lady orchids and glories. 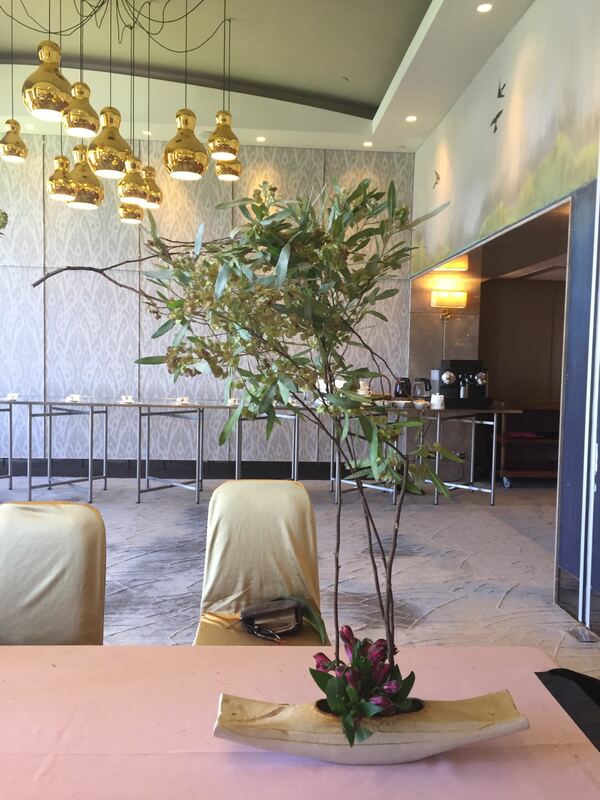 The dried rubber tree leaves floated from the arrangement to the ceiling in elegant lines, creating a light and airy feeling. 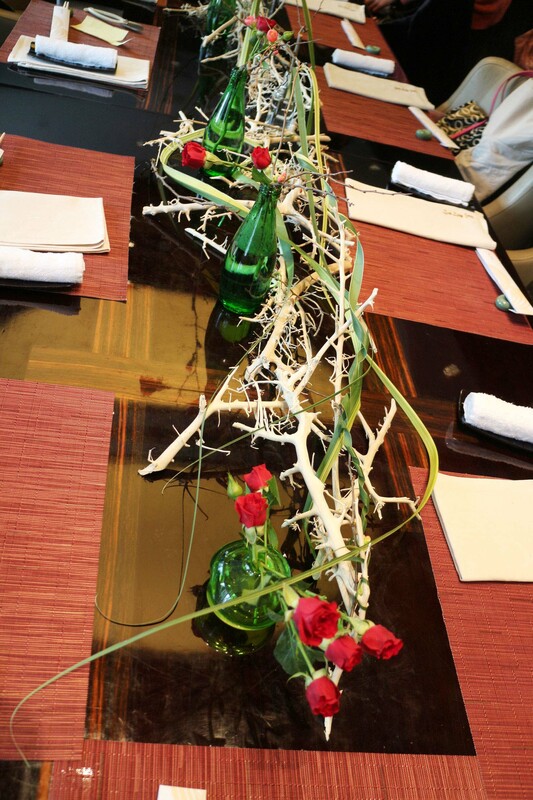 A truly exquisite creation to greet our guests! 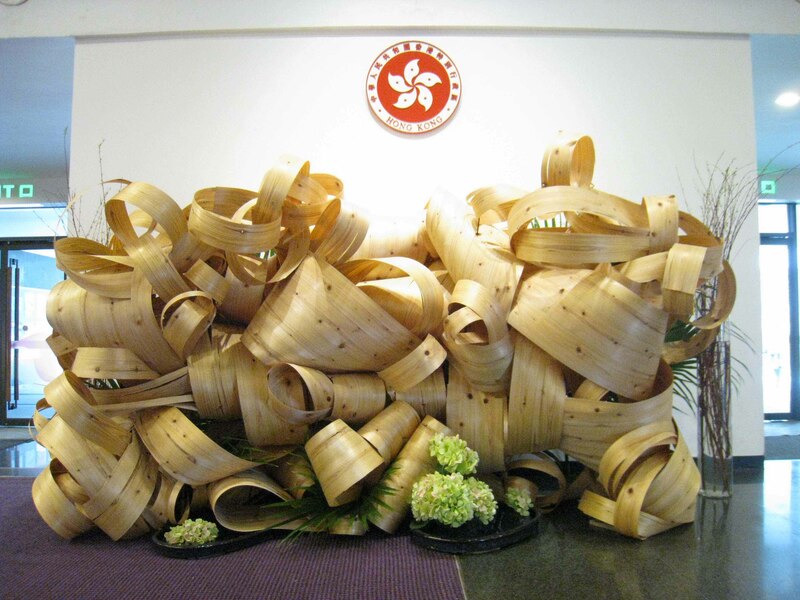 The very fine bamboo pieces had been wired to form squares of different sizes. 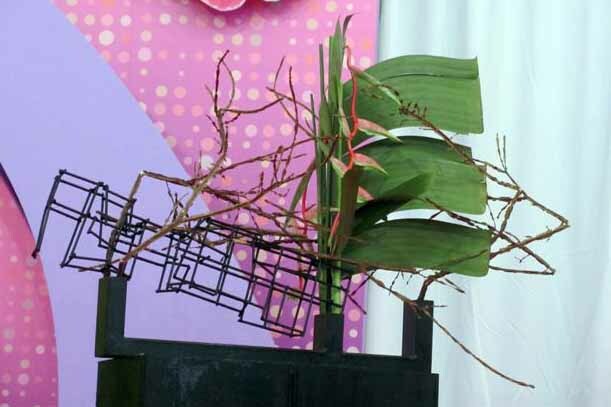 These squares were placed at different angles giving depth and colored bamboo strips were added as accents. 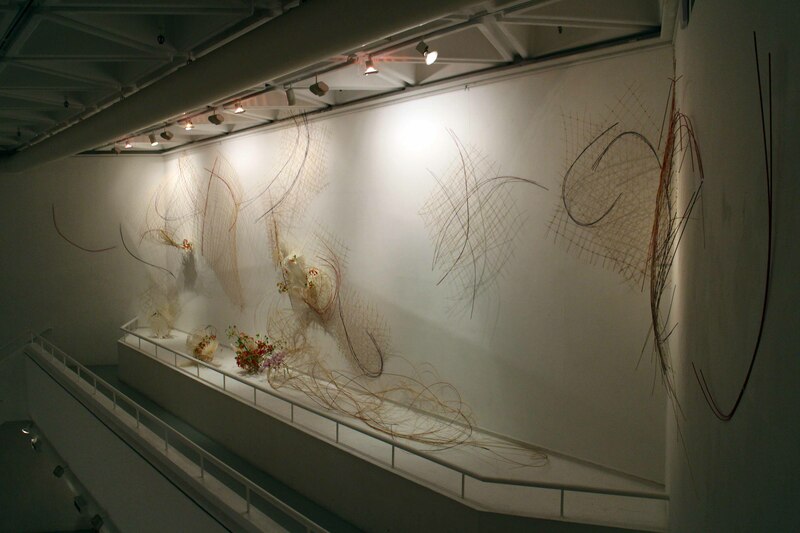 The created round shapes plus huge irregular mass made the connection from the wall to the platform below. 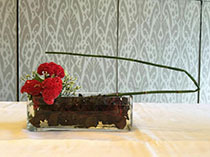 The arrangement got its final touch with the wonderful red of the gloriosa lilies. 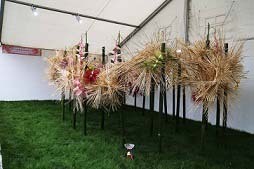 Two fences like constructions with on hundred pieces of dogwood, branches, grasses, New Zealand flax came to be after six small trees were securely fastened vertically to iron sands. 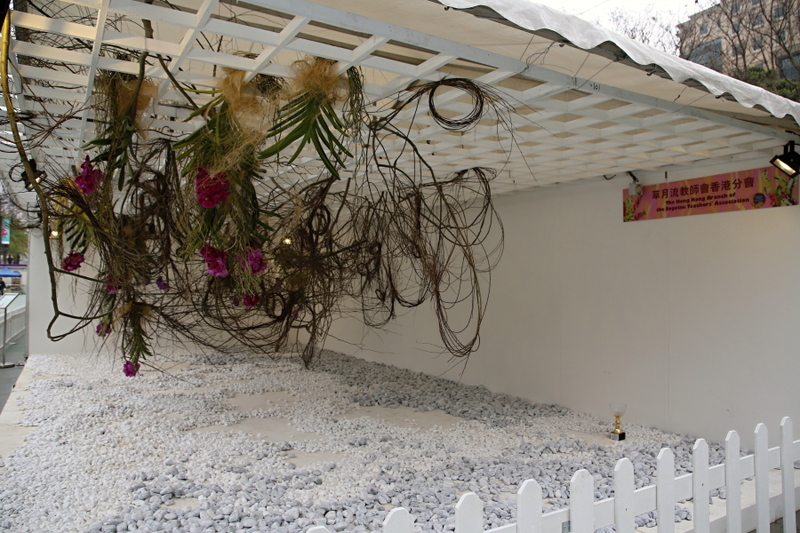 All the mentioned materials were wired onto it horizontally. 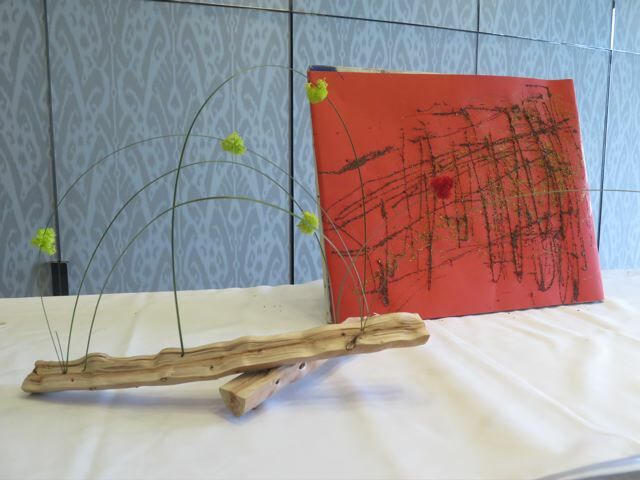 Creating an interesting structure in red, green and brown with a bit of yellow. The two “fences” were shifted slightly apart to give some depth to the work. 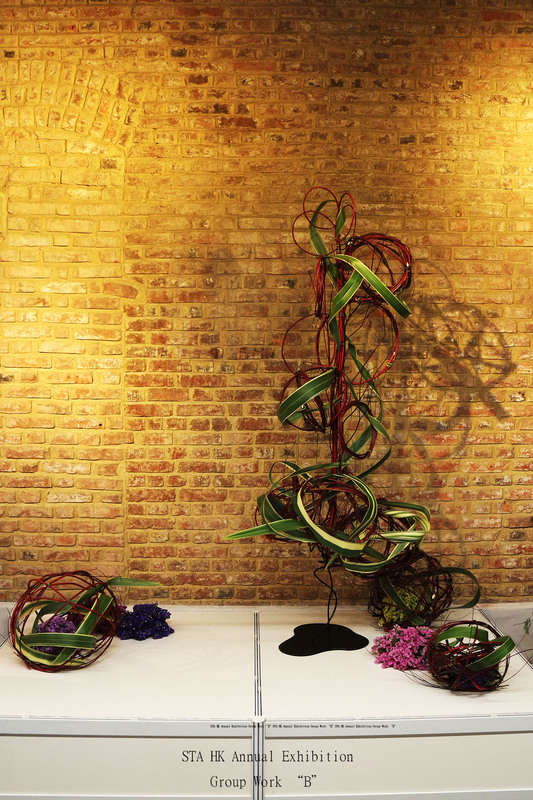 STA HK combined dried and colored fresh Traveler’s Palm Flower to create space and movement. The floor was covered with the fresh turf for the contract as well as the reflection. 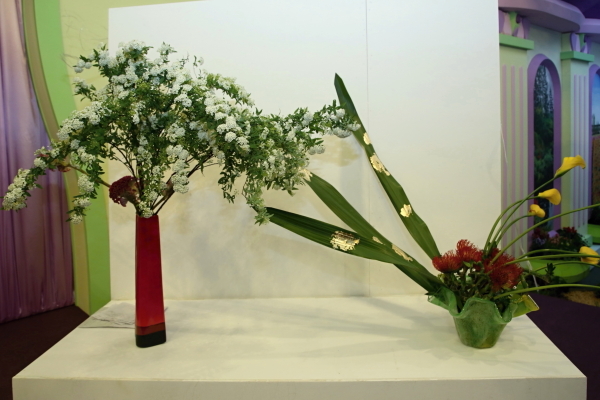 Three different colors of the dendrobium in the big shallow containers had been added to become a focus of the whole. 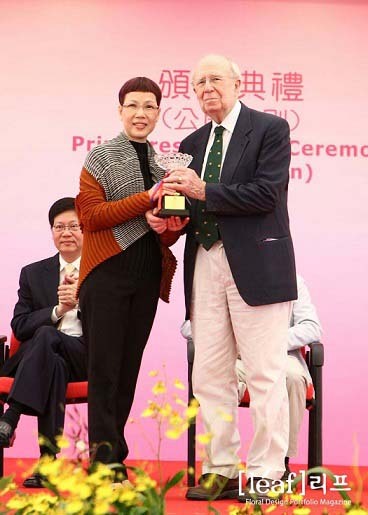 The exhibit won the Special Award for Unique Feature of HKFS 2013. 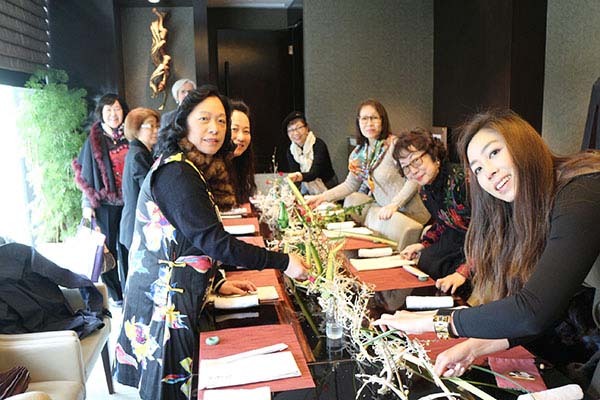 This year, Ms. Eikou Sumura, a Master Instructor from the Headquarters, visited Hong Kong with her daughter and gave us a creative demonstration on 24 March. 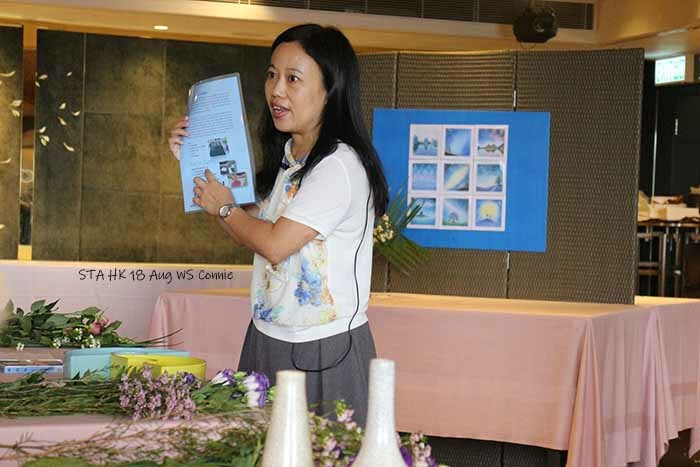 She created 6 arrangements. 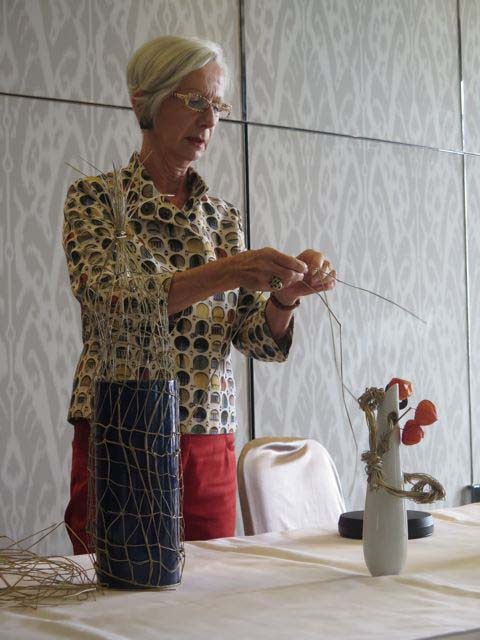 For the last one, she used the box stands with palm and thick vine to create structure. 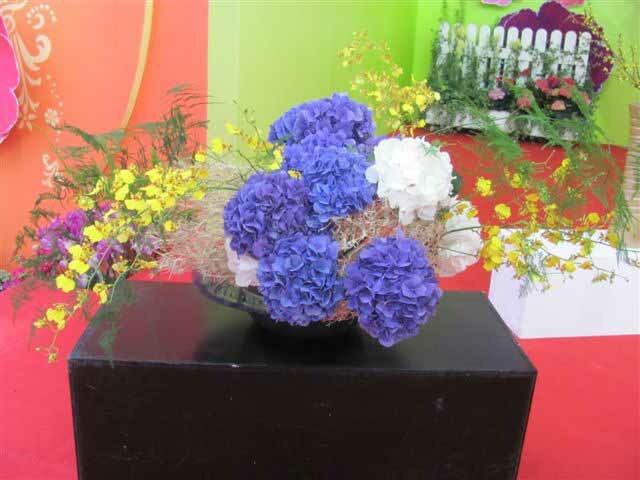 Four big containers had been put in different place to display different materials. The green Love-lies-bleeding & Asparagus &, yellow Forthysia, Limonium, red hydrangea contrasted with one another well and it was interesting. 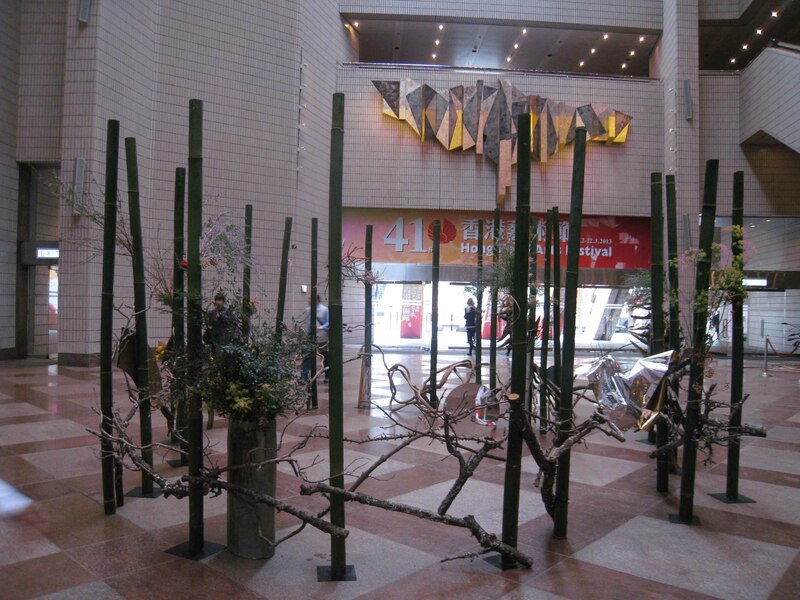 enjoy from on the G/F., Cultural Centre, Tsimshatsui from 20 February until 24 March 2013. You are welcome with free admission. 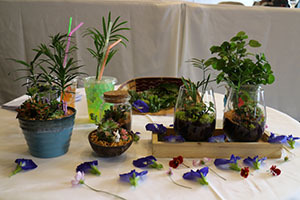 Our Annual Exhibition went very successfully and was well attended, same as last year. 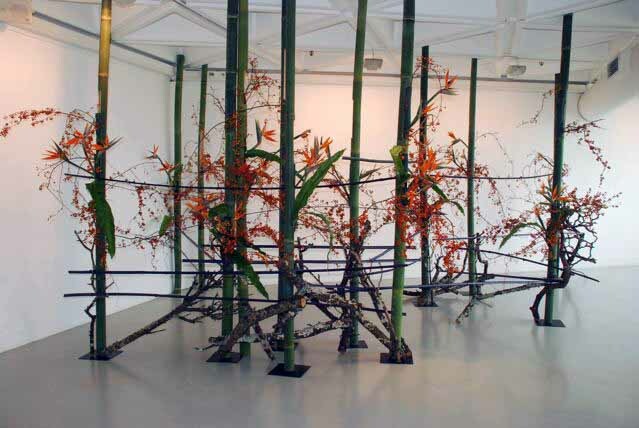 The bamboo poles stand securely first before the moss covered wood was attached to give the structure more stability. 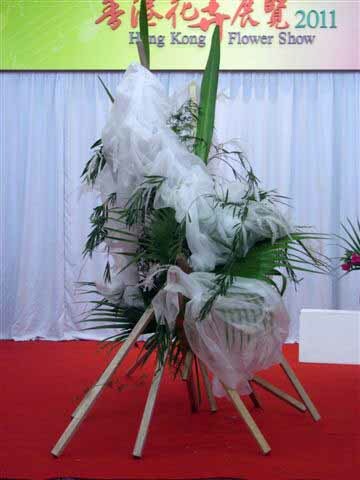 Glorious bittersweet was added, flowing from one bamboo pole to the next and Birds of Paradise flowers inserted in the cut out windows of the bamboo poles. 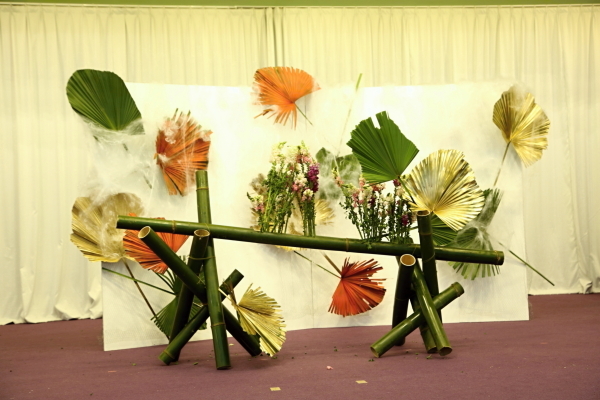 The final touch was added with the split bamboo, which had been painted in purple, to create lines and finish an impressive arrangement to greet the visitors. 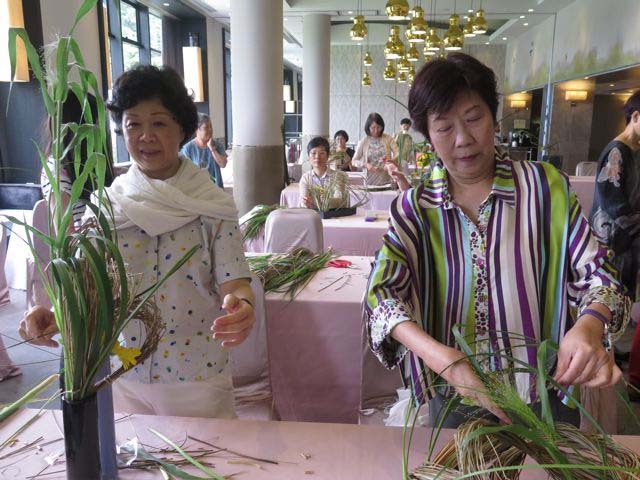 In the small room, Fresh split bamboo had been assembled into a ball where some dried sago palm had already been inserted. mostly on the upper parts in order to draw the eyes towards the ball in the middle of the room. Lighting additionally emphasized the structure. The 5th floor created the desired layout for the wall. Hanging these woods on the wall was ably done. 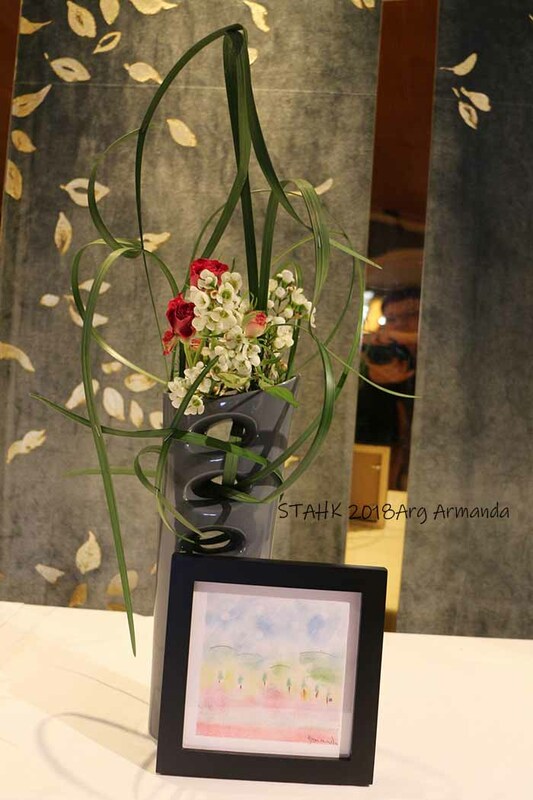 Lovely shadows were created and a simple but utterly suitable "after the typhoon" arrangement came to be. 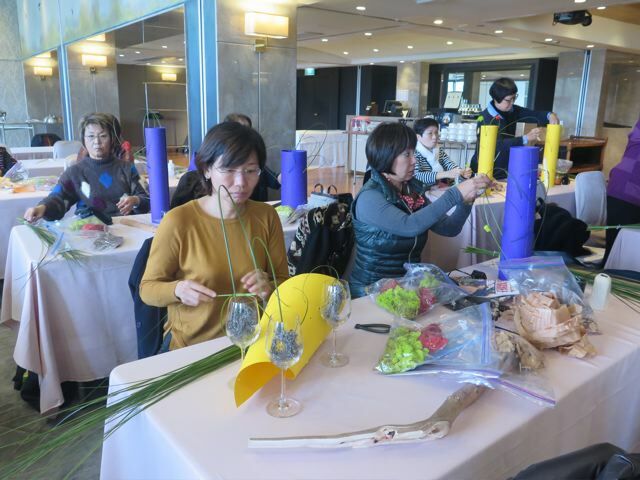 On 25 March, Mrs. Yoko Ebuchi, an experience teacher from Japan, has given a demonstration by using Japanese materials during the HKFS, which the audience enjoyed very much. 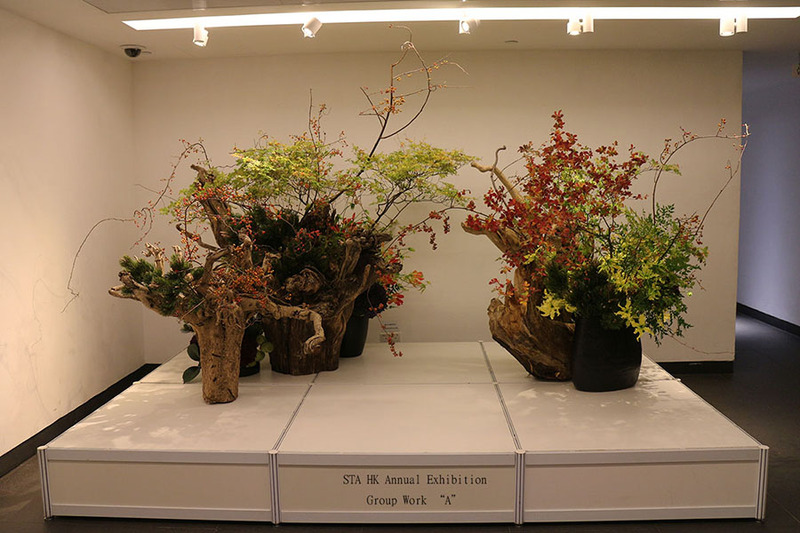 STA HK used the Cedar Veneer to create the group exhibit for a challenge, together with windmill palm, hydrangea, colored bamboo and wooden frames. 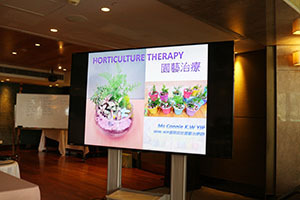 The exhibit won the Grand Award for Unique Feature of HKFS 2012. STA put up a big arrangement in the foyer of HK City Hall, Central (Lower Block) for celebrating the City Hall 50th Anniversary for the HK Arts Festival Patrons to enjoy from Feb 7 until Mar 6, 2012. 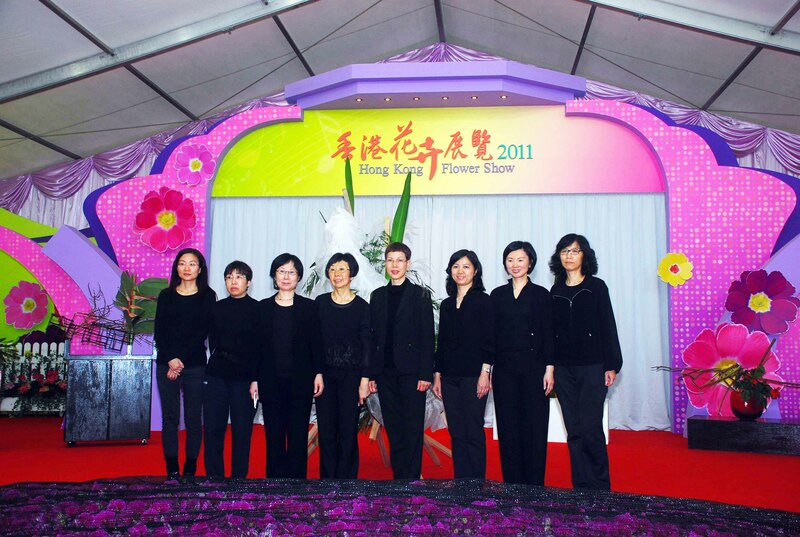 The Exhibition, held on 25-27 November 2011 at the H.K. 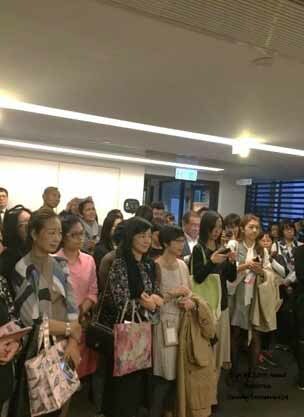 Arts Centre, Wanchai, was a great success and attracted hundreds of visitors. 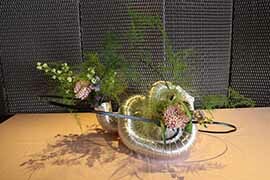 There were 30 individuals’ ikebana creations as well as 3 big group works. If you missed it, pleaseview here for the groups and gallery for some of the individual arrangements. 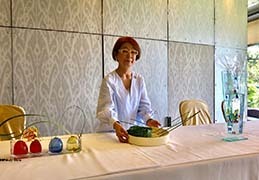 The demonstration, conducted by Ms. Suikei Sakaguchi, Master Instructor from Sogetsu Headquarters, was a great success. 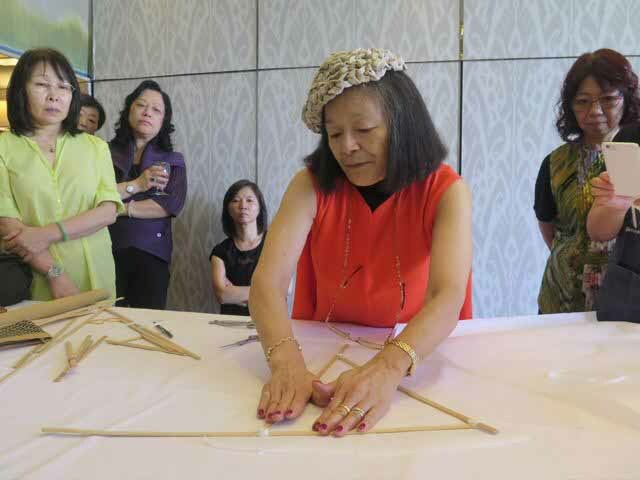 She gave a step-by-step demonstration of 8 arrangements together with a simple and clear explanation of arranging procedures and techniques. 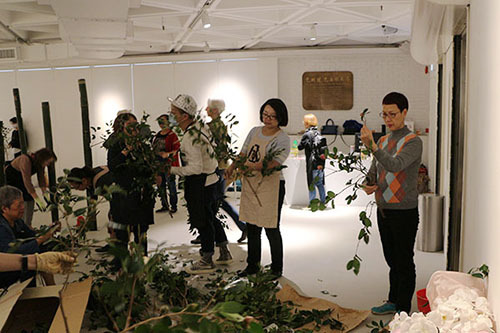 For the final arrangement, she brought out a big wooden structure and invited a few members of STA HK on stage to create a free style display with white non-woven cloth and various kinds of giant green leaves. 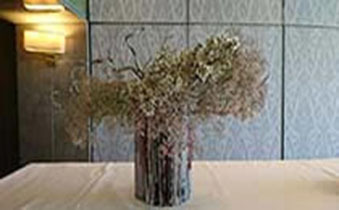 The arrangement turned out to appear as if a lady was posing in a white dress. 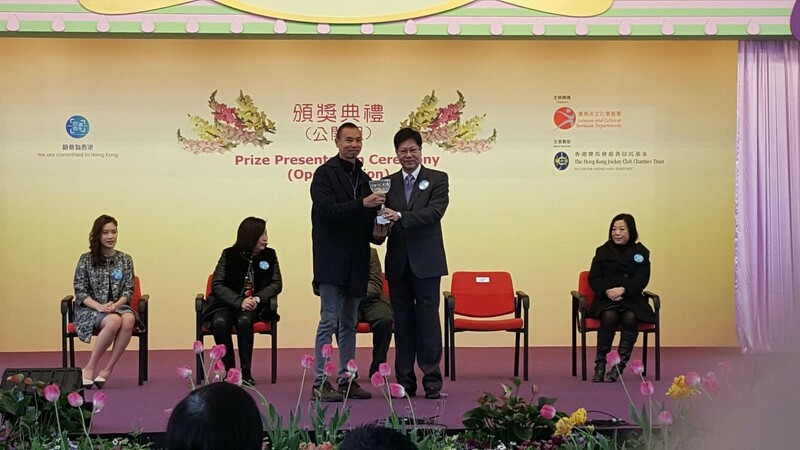 The exhibit of STA HK received the Grand Award for Design Excellence. 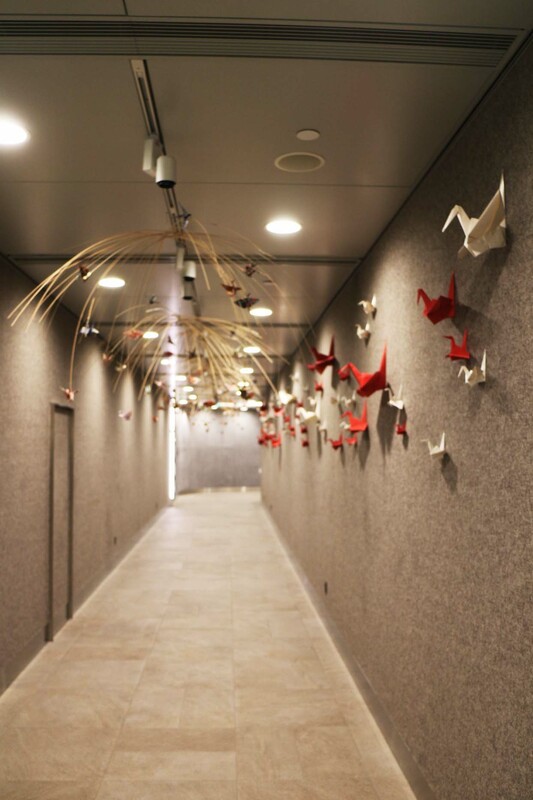 The black bamboo strips decorated with colorful panes of washi paper were hung high. The thick black wavy lines could be clearly spotted even from a far distance. It was very eye-catching!